By Print Solutions, Earth Island. 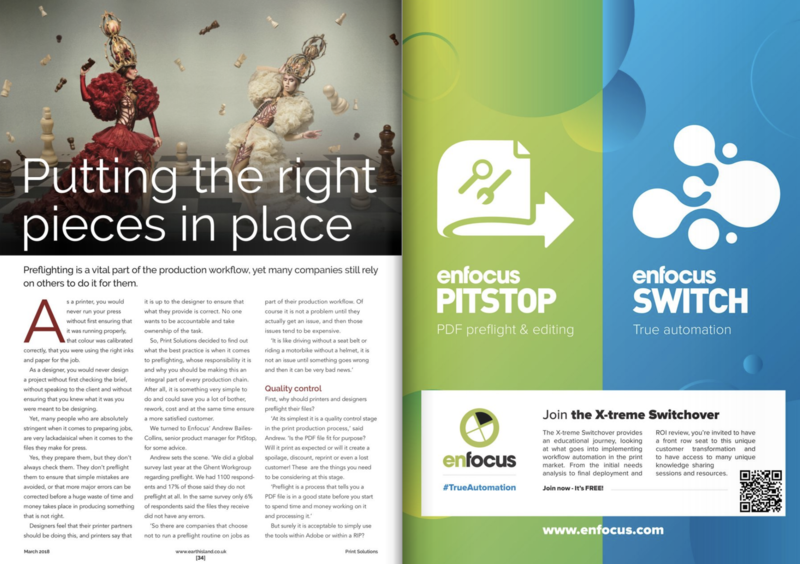 Press Coverage: This month we are proud to work with Print Solutions magazine and provide a comprehensive overview of the best practices of preflighting. Our very own preflight guru, Andrew Bailles-Collins, PitStop Senior Product manager, talks to Print Solution Editor, Susan Wright, about this vital part of the production workflow. "We did a global survey last year at Ghent Workgroup regarding preflight. We had 1100 respondents and 17% of those said they do not preflight at all. In the same survey, only 6% of respondents said the files they receive did not have any errors. "So there are companies that choose not to run a preflight routine on jobs as part of their production workflow. Of course it is not a problem until they actually get an issue, and then those issues tend to be expensive. "It is like driving without a seatbealt or riding a motorbike without a helmet, it is not an issue until somthing goes wrong and then it can be very bad news." The Earth Island team has more than 100 years of media, marketing and publishing experience across print and online publications. Earth Island publishes a diverse range of magazines across several markets, including leading monthly Print Solutions, as well as Packaging Solutions, Green Solutions and IndPrint, as well as a series of helpful guides.